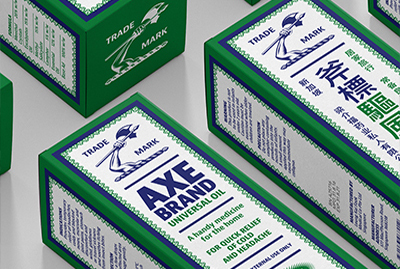 Axe Brand Universal Oil is one of Singapore’s most renowned and iconic ‘heritage’ brands. Made and distributed by local manufacturer LKF Medical, this little cure-all bottle is now used by people in more than 50 countries around the world, from children in Singapore to pilgrims in Saudi Arabia and villagers in Kenya. It isn’t hard to understand why. This single oil with a distinctive fragrance relieves the symptoms of a wide range of everyday ailments including headaches, nausea, rheumatism, bruises, muscle pain, joint pain, insect bites and colds. And yet despite this multi-purpose effectiveness, it has a very low price point. 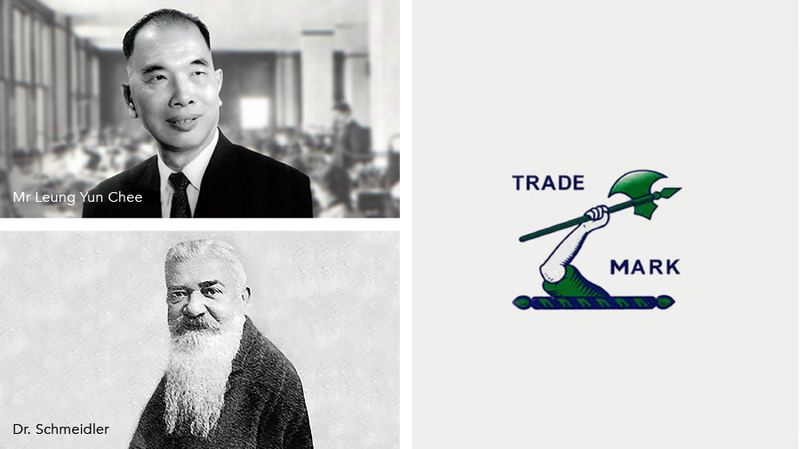 Created in 1928 by LKF Medical’s founder Mr Leung Yun Chee, Axe Brand was conceived after a chance meeting between Mr Leung and a German physician called Dr. Schmeidler. He gave him a recipe for a medicated oil said to cure all manner of ailments, composed of a mix of menthol crystal and camphor, eucalyptus and lavender oils. 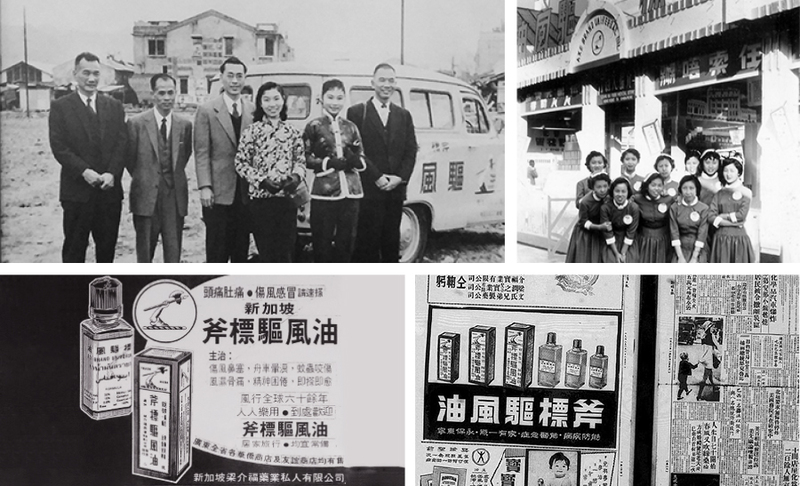 At first, the effectiveness of the oil was not widely recognized, and it faced stiff competition from competing brands in China and Hong Kong. Undeterred and naturally ambitious, founder Leung Yun Chee set about marketing his new product. With canny marketing Mr Leung named it ‘Axe Brand’ because almost every household in Singapore at the time had an axe, to chop firewood for cooking. He then employed a team of illustrators and graphic designers to help him craft an enduring and now iconic visual identity. Hence its instantly recognizable axe motif, which has a heraldic look. He also devised its distinctive blue and green packaging, a signature feature of the brand to this day. Apparently the blue and green was chosen because Axe brand is omnipresent — “where there is sky, water and land, you’ll find Axe Brand Oil”. Next Leung Yun Chee started producing pamphlets detailing the benefits of the oil which he distributed all over Singapore, and sure enough, sales began to pick up. To pitch his new product to medical shops, Mr Leung would dress up in a Western suit and employ a uniformed chauffeur to drive him around in a fancy limousine. Thinking he was a prominent businessman, the shopkeepers would come out to talk to him. Already in the 1930s, he was making use of promotional gifts like calendars and free samples. During the Second World War, sales were given a further boost as overseas trade ceased, eliminating all of LKF’s competitors. In the 1950s, he even started a newspaper to give Axe Oil more prominence, and distributed pamphlets which had famous stories on one side and Axe Oil advertisements on the other. He also employed a large team of sales girls all dressed in eye-catching uniforms. In the 1960s, Mr Leung began exporting his product to Indonesia, adding a third market beyond Axe Barnd’s home base of Singapore and Malaysia. Another significant foreign market was Saudi Arabia, after he cannily marketed his oil to pilgrims on their way to Hajj. As the popularity of Axe Brand grew among SE Asian pilgrims, so it spread to Hajj pilgrims from other nations. 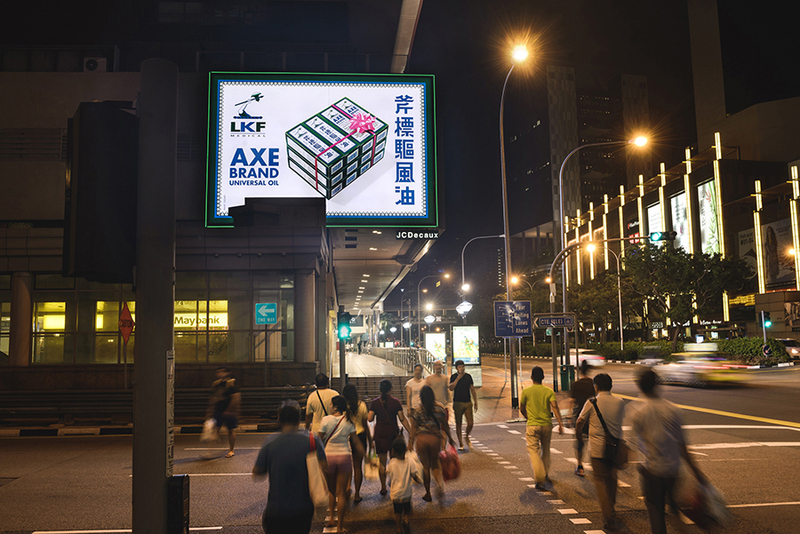 So LKF Medical began exporting Axe Brand to the UAE, Saudi Arabia, and Jordan. From that time onwards and into the present, Axe Oil has seen sales success in China, Hong Kong and African countries including Kenya and Nigeria. So Axe Brand Oil has enjoyed outstanding growth over the years, inspiring a number of copycat medicated oil products aping its distinctive Chinese style and blue-green border. Today, Axe Brand continues to be successful, boosted by marketing campaigns that keep the brand in the public’s eye. 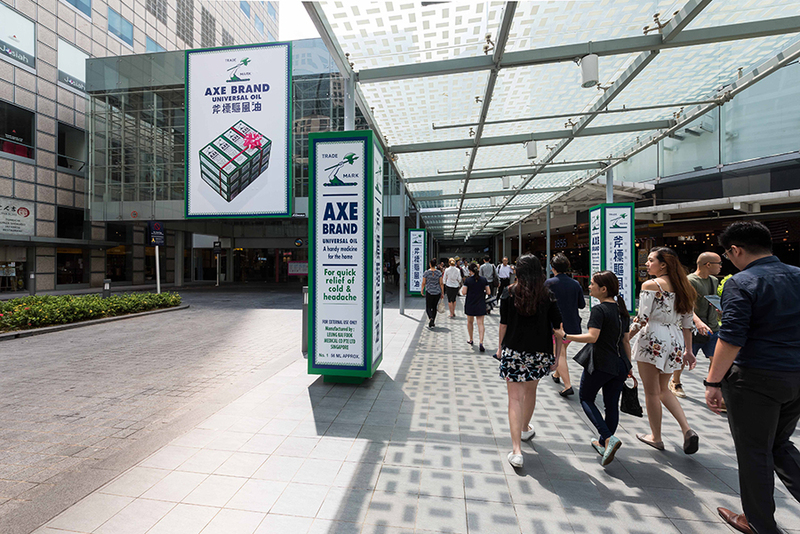 2017 saw Axe Brand go big and bold with 3-D displays of its iconic packaging in a huge outdoor campaign island-wide, including a major push at venues like Suntec City. 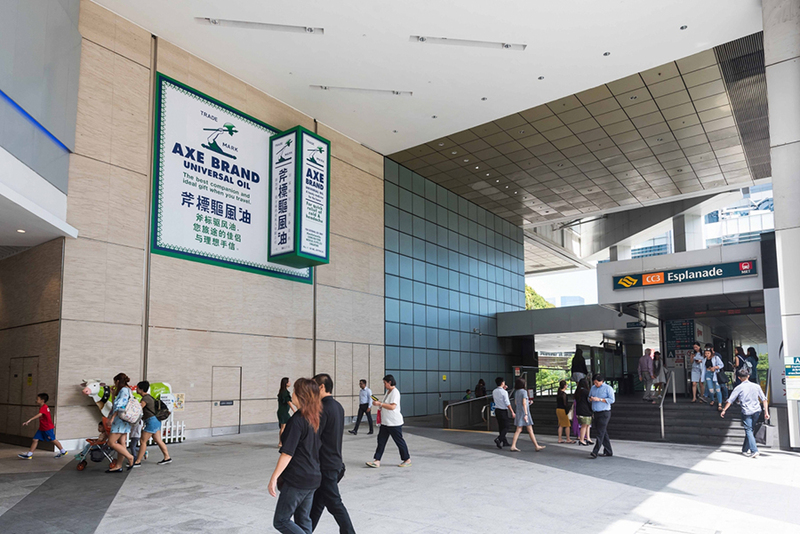 However, despite considerable success internationally and among the older generation locally, Axe Brand is not so popular with the young in Singapore, who find it dated, too traditional looking, and associated only with the elderly. Indeed, some people call it “old lady’s perfume”. To sophisticated Millenials it’s uncool image and lack of scientific endorsement is also a minus. Part of that is due to its packaging. 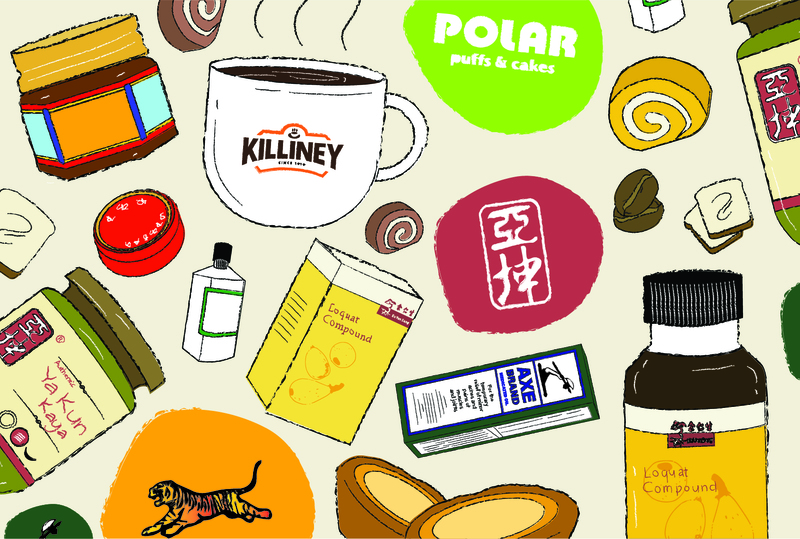 Its very ‘Traditional Chinese Medicine’ look hasn’t changed since the beginning, and while that has contributed to its iconic status and scores high on authenticity, it lacks sophistication. This lack of sophistication is reflected in the way it is promoted too. Its early success was due to the innovative way it was promoted by the founder, who was a bit of a marketing genius. That early brand-building flair appears to be lacking nowadays, and the company seem to be resting a bit too much on its laurels. Even its recent ‘big and bold’ advertising campaign lacks a central idea. It’s basically just the classic advertising staple of the big pack-shot. So we feel that the brand is not as successful as it could be in the local market, especially among the younger generation. 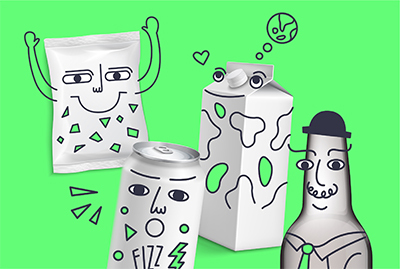 Which is why we asked ourselves the question, ‘how would we revitalize a brand like this – an old classic which is still doing well, but perhaps is too complacent, and could certainly do much better with the right kind of fine tuning’? Find out in our next blog article, ‘Sharpening up the old axe’ where we give our take on how to update the brand without losing its sense of authenticity.